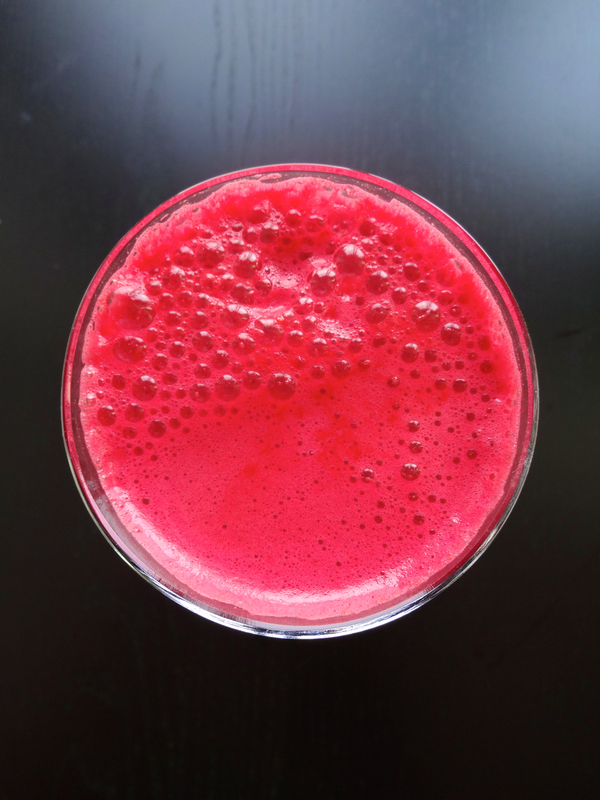 This gorgeously hued crimson juice is delightfully sweet and totally refreshing. Upfront disclosure: the recipe was adapted from Gwyneth Paltrow's new cookbook It's All Good. In my defense, all of her recipes (at least the ones I've tried) are excellent. The book is good and the recipes work. Second disclosure: I am not the biggest fan of red beets. This is why I generally prefer to work with golden beets as they're much prettier and will not leave pink stains everywhere. But I have to admit that red beets work perfectly in juices - they give the juice a delicious sweet flavor and lend a gorgeous fuchsia color to it. And I tend to like pretty pink things so here we are. Another point about beets - the juice may seem wasteful at first but you can save your beet greens and the vegetable pulp. The greens can be served alone or added to a soup and they'll be completely delicious. The pulp can be used in baked goods or veggie burgers (I'm working on a recipe, in fact). Juice the carrots and beets first. At this point, you can remove the vegetable pulp if you need to repurpose it for another recipe (I had to). If not, proceed with the fruit, ginger and citrus. Because the carrots and beets are pretty dense, I find it helps to add a pear or some melon or other juicy fruit to lighten the whole thing. But you can leave it out, if you want the original Paltrow treatment. Yes - that is the Eiffel Tower. I manically collect postcards and this is my dish towel equivalent of a Parisian postcard. Drink your beets & leave me a comment (or send me a postcard).